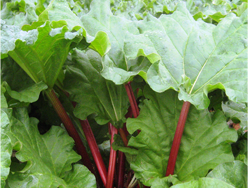 Welcome to Rhubarbcrowns.com, wholesale suppliers of Oregon-grown “Crimson Red” rhubarb. Our diversified farm, West Union Gardens, has been in operation since 1988, mostly producing fresh-market berries and vegetables. In the last few years, we have expanded our rhubarb stock production so that we are able to ship premium root divisions of “Crimson Red” rhubarb. "Crimson Red" is the standard rhubarb variety in the fresh and processing markets in the Pacific Northwest. It has a true red stem inside and out. We ship large divisions, averaging 14 oz. Crown size affects the beginning of the rhubarb plant's new life. The larger the rhubarb crown the more energy is retained. Larger rhubarb crowns are viable out of the ground for longer. Crown size is directly related to the time it takes to establish a harvestable rhubarb plant. Our winter & spring shipping season is closed. If you would like to be added to our fall mailing list, or just want more information, please send us an email, or call us at 503-645-1592.